Looking for a strategic edge?! Try this custom made rollover/snake-shot/wrist-rocket wrap to give you that extra slip free control of the handle. 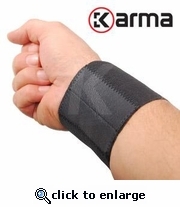 The elastic stretch band attaches with velcro strips to your wrist. Sewn in leather pad firmly grips the handle. SIZING TIP: measure the circumference of your wrist & add 1.5" (or 6cm) and that should be your WristWrap size! Note with the stretchy band, your personal preference may come into play based on how snug you want the fit! So if you wrist is 7.5" around... look at the "L 9.055in" for a snug fit!